Looking to get healthier, heal gut damage, or simply eat more nutritious foods every day? Jump start a healthier you with a super smoothie! Are you looking for an easy way to add more nutrition and superfoods into your daily routine? Maybe you’re trying to correction nutritional imbalances or heal gut damage in yourself (or your kids) – or perhaps you know you need to nourish yourself in early pregnancy, but nothing sounds good… or stays down! A nourishing smoothie can help with all of these things and more. Even if you eat a nutrient-dense diet, it can be challenging to get everything you need into your daily (or weekly) diet. Families often find they need to heal gut and digestion problems, overcome food sensitives, or maximize nutrition during conception or pregnancy. Nutrient-dense smoothies are also built upon probiotic power. They nourish your microbiota (the “good bacteria” living in your body). Probiotics are essential to healing the gut. Probiotics may also help prevent or resolve morning sickness, nutrient deficiency, and more. I’ll explain how different ingredients help you boost your health as I show you how to build a better smoothie. Let’s mix it up! My favorite base is a mix of yogurt and kefir so I get a good mix of probiotic bacteria (and I like the creamy factor yogurt brings to the combination). If you use coconut milk, coconut water, or nut milks, make sure the product you’re using is pure and free of added sweeteners and fillers. It’s ideal for your base to be a probiotic in and of itself. Yogurt and kefir with living cultures already have beneficial, live bacteria. If you use another base, you may want to culture it with a kefir to get it ready for your smoothie. You make all kefirs on the counter – they require no heating like yogurt does, so it’s super-easy. I usually make a full blender to divide between my husband and myself and a second blender for our children (3 older kids, 3 young kids, and an 11-month old who only has a teaspoon or so – soon we will need another blender full!). I fill the blender about a third full with the base. Berries are a superfood. They’re loaded with flavor and packed with antioxidants. Berries are also convenient to buy frozen. They’re a low carbohydrate fruit if you want to keep your smoothie low-carb (it’s ideal to use milk kefir as the base of a low-carb smoothie). They also add a lovely color to your smoothie! I use 1/2 cup of mixed berries for an adult smoothie batch and 1 cup for the children’s. Greens are alkalizing and packed with antioxidants, vitamins, and even trace minerals. It’s good to choose greens you know were raised in nutrient-rich soil, because those will have the most trace minerals. You can sneak greens into smoothies easily, so it’s a good way to boost your veggie count for the day. Our family actually uses Amazing Grass Green Superfood to get our greens (we generally use the Antioxidant blend) because it’s easier for me, but you can use greens of your choice. Spirulina is also considered a “super green” by some (it’s actually a blue-green algae) and can add a nutrient boost to your smoothie. A handful of greens or a scoop of Amazing Grass works well. Gelatin is an excellent – and I feel essential – addition to a smoothie being used for gut healing (or during pregnancy). It’s packed with protein and helps with collagen production. It’s also rich in amino acids that have multiple benefits, including enhancing sleep. Gelatin helps soothe and heal the digestive tract. Use a high-quality gelatin, like Great Lakes brand of pure, grass-fed beef gelatin. If you don’t like clumping and want to avoid having to carefully sprinkle, you can get hydrolysate gelatin, which stays smooth even in cold. A tablespoon or so is good for a blender full of smoothie. If you’re looking specifically for a nutrient-dense smoothie for pregnancy (and beating morning sickness) check out my Ultimate Guide to a Fabulous Pregnancy. This starch is indigestible, but that doesn’t mean you want to avoid it. The probiotic bacteria in your smoothie – and the ones in your digestive system – love it. I strongly feel that probiotic, resistant starch smoothies helped me get through my last pregnancy morning sickness free (baby #7 after successively worse morning sickness with previous babies!). There are various ways to find/create resistant starch, but for smoothies I like potato starch. Bob’s Redmill is a possible brand. Make sure to potato starch, not flour. Start small and build up to a couple of tablespoons per blender full. Some bananas also form resistant starch – we’ll cover those below. You can add extra probiotics into your smoothie by opening up a cap of high-quality probiotic supplement (or using a loose powder, as many infant probiotics are). Just pour into the blender just before you mix the smoothie. This is a pre-biotic, so it also nurtures probiotic bacteria. We use one scoop of Jarrow brand in a blender full of smoothie. I actually consider egg yolk essential to a smoothie – eggs are almost like nature’s vitamin 😉 Use yolks from pastured hens. Otherwise, you may want to save eggs for a cooked dish. Raw yolks in a smoothie are truly nutrient dense and extra yolks are a great idea if you’re trying to conceive, pregnant, or nursing. It’s hard to get enough magnesium in the diet, so magnesium powder can be blended into your smoothie to give you extra, especially if magnesium oil doesn’t work well for you. We like Natural Calm brand, and I actually like to drink it mixed into hot water like a tea – but smoothies make it easy to get a little in for my kids. If you’re taking a liquid or powdered vitamin supplement, blend it right up into your smoothie. Add a high-quality, powdered Vitamin C in during cold and flu season, or whenever you need an immune boost. Sometimes it’s helpful to supplement with extra C during pregnancy, too. This one is all about flavor and texture, but you can use cultured sour cream (or creme fraiche) to add more probiotic bacteria. A scoop of sour cream adds a burst of creaminess and and fun lift to the flavor of your smoothie. You can add coconut oil to any smoothie to get extra healthy fats and the antimicrobial properties of coconut. Coconut oil solidifies in a cold smoothie, leaving you with a texture. My kids like the tiny bits of hardened coconut oil in their smoothies, but if your child wants only a smooth texture, skip the oil and stick with coconut milk. Of course you can add any fruit combination you want to create various, delicious smoothies. I stick with berries for my husband and myself to keep our smoothies lower-carb, but we use a variety of fruits for the kids. I did want to mention bananas specifically. Green bananas (under-ripe) are actually a great source of resistant starch. There’s even a company that makes green banana “flour” which you can use like resistant starch in your smoothie. But if you’re going for that creamy banana texture in your smoothie, you can experiment with green bananas. Sometimes I put ice cubes in my smoothies and sometimes I don’t. Generally, it depends on how much yogurt I have available to make a thick, creamy smoothie 😉 A great idea I’ve heard, but haven’t tried, is to freeze water kefir, or coconut water kefir, in ice cube trays and use that in your smoothie. Avocado cubes are another way to add a creamy touch and extra healthy fats to your smoothie. Some families like to add a little iodine or kelp powder to their smoothies. Some like to sprinkle nuts on top of their smoothie, which gives a nice nutty, possibly salty, offset to the smoothie (you might also want to put a pinch of high-quality salt into your smoothie to help the sweet flavors have more “burst” to them). Macadamia nuts are a softer, fatty nut that can help make a creamier smoothie if added into the blender. Cocoa powder (or its uncooked version, cacao powder) can be mixed into your smoothie to make a tasty “chocolate shake” style treat. There may also be antioxidant benefits from including cocoa, and small amounts of choline. Choline is a nutrient vital for your brain, and especially baby’s brain if you’re pregnant (egg yolks are the best source of choline!). Simple, natural extracts, such as vanilla or peppermint, add flavor and fun to your smoothie. They help you whip up smoothies that have a taste that fits your mood, the season, and what you know your little ones will love! It’s easy to whip together smoothies. To enjoy the nutrient boost and gut and digestion-healing impact, it’s good to have smoothies regularly. 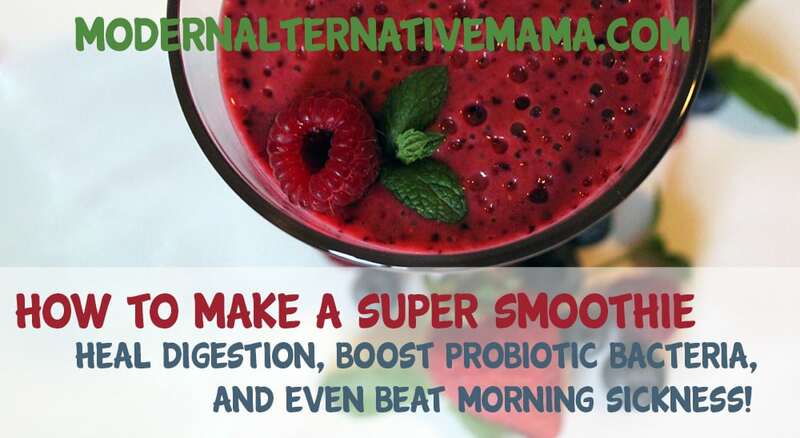 If you’re trying to prevent or get rid of morning sickness, daily probiotic and super-food smoothies over a couple of weeks are a needed kick-start. It’s possible to mix up your smoothie in advance and freeze. I like to measure out ingredients other than the base of my smoothie and an extra probiotic cap into a glass jar (such as a canning jar). So I put fruits, greens or greens powder, etc. into the jars. Then I refrigerate a few days worth of jars at a time. When it’s time to make the smoothie, I pull out a jar and my yogurt or kefir. I add the base first, then add in the contents of the jar. Then I break open my probiotic cap and mix! This makes busy mornings go even faster. I can pour smoothie right back into the jar to drink 🙂 Quick, easy, and delicious! Kristen Burgess is passionate about helping mamas have healthy, happy babies. She writes at Natural Birth and Baby Care.com, where she shares birth & baby adventures from her life with her husband and six children (all born naturally). She passionately researches evidence-based information on pregnancy and childbirth, and loves to support moms personally through her online childbirth classes.